Shopping Hubs | Explore Caribbean - Caribbean. Explore and Visit Caribbean Islands, go for official information on travel, accommodations, hotels, history, food, culture and the best shopping, clubs and cultural events. Travel Guide to Caribbean. The Caribbean Islands would take you to probably one of your best and unique shopping experiences. Why? 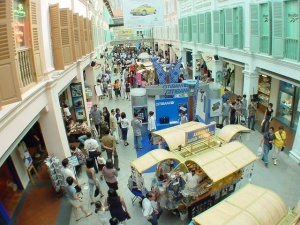 These areas are known for its tax-free shopping. A lot of designer fashions, cigars, jewelry, and liquor are relatively cheaper aside from the bargains that are widely available. Items to watch for in Anguilla include linens and handcrafted products, painted woodcarvings, pottery and sculptures sold by local artists. The World Art and Antiques has most of the finest archaic Chinese bronzes and jades as well as antique ceramics of Asia. Great finds are textiles from Cambodia, Laos and India. Vinissimo, however houses a notable collection of wines from all over the word. Enjoy duty-free shopping in Antigua. Find items like hand-made dolls, pottery straw and shell work. Stop by the Gourmet Basket, which opens at 9:00 in the morning to 7:00 in the evening and you’ll find high quality fruits, vegetables, fish and meat, freshly cut for your needs. Batik and other natural fabrics are available in JingJok while snorkeling and fishing equipment in AquaSports. Prominent in Aruba are specialty stores like the African Art Shop displaying wooden crafts made from mahogany, olivewood and ebony; Ecco offers gift and souvenir items as swell as beachwear for men and ladies. Items are absolutely no sales tax. Barbados with its strong relations to Britain, offers wide-range of bargains on British products just like the Virgin Islands- From watches to jewelry to perfume and fabrics, handmade dolls and glass arts, other luxury items specially sold by Little Switzerland. Take home for a souvenir some BVI stamps, the only British Commonwealth stamp sold in US currency. Locally produced in Cayman Islands are hammocks, shell-made jewelry, and corals. Find coffee table boos, learning videos as well as pet products and sports supplies from Hobbies and Boots, Ltd, Cayman’s supplier of these items for almost 36 years. There are two major florists in the area, Send flowers anywhere in the world with Every Bloomin’ Thing and specialize your wedding with the out of the ordinary cut flowers of Trisha’s Roses Wedding Services. Curacao is famous for its laraha fruit liquor and Amstel beer, made with distilled water. You’ll find market with vendors from Venezuela with products directly selling from their boats. Specialty store include Sea & Sand Beachwear, a photo outlet, Boolchand’s and the Curacao culture Shop, for handcrafted products. One of the famous boutiques you’ll find in the Dominican Republic is that of Oscar de La Renta. Aside from that, cigars from Ciabo Valley and those handmade in Santiago are few of the most sought after kinds. Jewelry is trendy and luxurious as amber can be found in the country. Get a trip to Grenada for a basket-filled Spice shopping or to Jamaica for souvenirs like rum, handmade sandals and woven baskets. Puerto Rico however is popular to hand carved religious figurines, 10-string guitars and hand-rolled cigars. Downtown Gustavia in St. Barts is a place to hunt for Italian and French fashion as well as fine wine stocks. Main shopping districts In St. Croix are Frederiksted and Christiansted. Trendy in St. Kitts are beach wraps called pareus while St. Lucia is more into clay pottery, cane furniture, cocoa, bottled hot sauces and coffee. St Martin is famous for its shopping getaways. The Scuba Shop offers wide range of snorkel and scuba gears like AquaLung, Scubapro, Mares and Sherwood while men’s clothing are available at Casa Nova; women’s clothing at Tuula. Charlotte Amalie is the shopping capital of St. Thomas scenic with linens, crystal, perfume, liquor and other luxury goods. Discover a large collection of high-end jewelry at Diamond Palace and Royal Caribbean; Perfumes at Tropicana Perfume Shoppe. St Vincent is known for mats made of grass; Trinidad for Angostura Bitters and Vat 19 rum or the Old Oak and Turks for metal and wood works. Great finds are at West Indies International Furniture. Primary currency is Eastern Caribbean dollar although some establishments accept credit cards as payment method.